The Zipline Modular Kids Chair with Ottoman is a fun and functional addition to any kid's room. The multifunctional flip design not only offers three different configurations, but is easy enough for any kid to set up on their own. 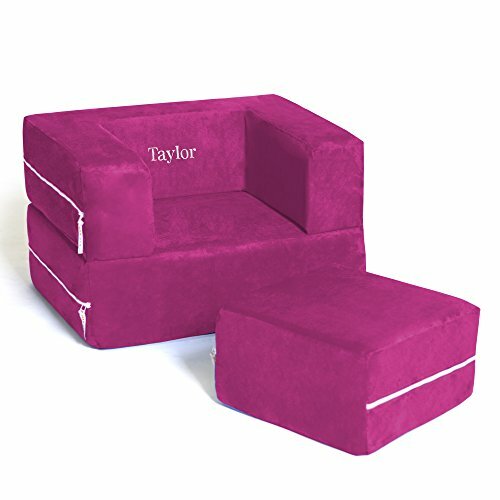 Kids can kick back in the chair form and use the accompanying ottoman to rest their feet after a long day of play. Stack the ottoman inside the chair, and the Zipline becomes a perfect table for games or a comfy stool to perch on. Even better, when the fun is done and it's time to relax, fold out the Zipline completely and spread out on the child-sized lounging platform. The durable and ultra-soft microsuede covers are removable and machine-washable. IMPORTANT: use the "GIFT MESSAGE" at Check-out. Click "this is a gift" in shopping cart, and type the personalization you want embroidered IN THE GIFT MESSAGE. 9 characters max. in length. Embroidery will be Times font lettering in White Thread as shown in image. Soft and durable microsuede covers are both removable and machine-washable. Features custom embroidery. Product Dimensions (inches): 26L x 20W x 16H (chair): 26L x 40W x 8H (lounging platform). Made with pride in the USA (Atlanta, GA). Due to custom personalization, this item cannot be returned. If any defects or issues arise, parts are covered under 1 year manufacturer's warranty.